3D printing for kids! Hey I want one First! Just found MachineDesign again and saw this tidbit. A 3D printer still in the prototype stage targets kids age 10 and up. Called the Origo, the device first started to take shape as inventor Artur Tchoukanov’s Masters project while he was attending the Umea Institute of Design in Sweden. Today, Origo is both the name of the device and the company. 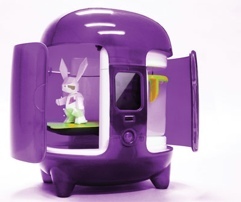 The device is intended to let kids print their own custom toys or small items. The printer is said to be as easy to use as an Xbox or Wii. Just for Kids? What’s that all about? I want one! This entry was posted in Future, Tech and tagged 3D Printing, personal tech by Sci Fi Engineer. Bookmark the permalink.